If you can’t smile with confidence or eat your favorite foods because of missing teeth, you probably feel like you’re missing out on life. Dentures and partials are an affordable and practical solution for replacing your missing teeth. Today’s traditional (or removable) dentures look more lifelike than ever before and even fit more comfortably. If you’re concerned about the fit or would like a more permanent solution, we can discuss the option of implant-retained dentures. If you are missing some or all of your teeth, traditional dentures are a suitable replacement that can help you look and feel more like yourself again. If only a few teeth are missing, a partial denture may be a practical option. Dentures and partials are both removable appliances featuring prosthetic teeth placed in a plastic base that resembles your gums. Some types of partials have clasps that fasten to your neighboring teeth. Dentures typically rely on either suction or adhesive to hold them in place. If you want a more secure and natural-looking solution, implant-retained dentures may be exactly what you are looking for. These handcrafted prostheses snap securely into the posts (which we can place) for a comfortable, more permanent fit that prevents sliding and slipping. These implants are modeled after the natural structure of your teeth and are anchored to the jaw. The post becomes a permanent part of your jaw through a process known as osseointegration. Dentures require daily care and maintenance to keep them looking great and fitting comfortably. To clean your dentures, simply remove them and then brush with a soft-bristled denture brush and a cleaning paste designed for dentures. Regular toothbrushes and toothpaste may be too abrasive for your dentures and could scratch or otherwise damage the finish. Anytime your dentures are out of your mouth, they should be kept moist to prevent them from drying out, which could cause them to change shape. It’s also important to only use cool or lukewarm water to clean your appliances since hot water can cause your dentures to warp. If you ever accidentally drop your dentures, call our office so we can check them. Even if you can’t see any damage, they may have bent slightly or cracked in a way that is not immediately visible. Wearing damaged dentures can lead to a buildup of bacteria in the appliance or cause sores on your gums. 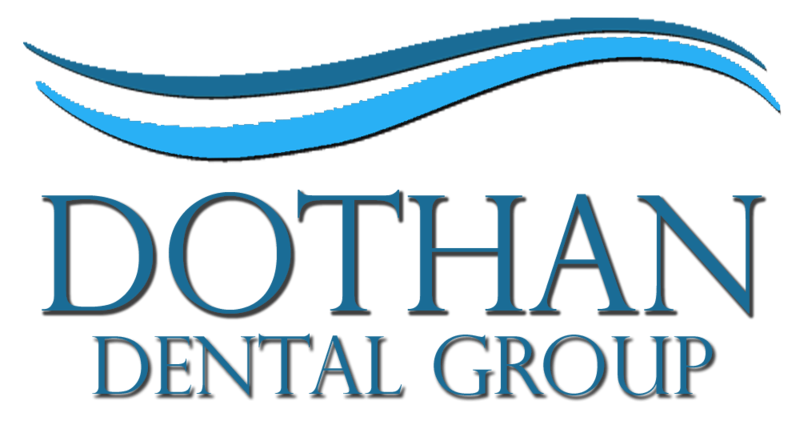 Call our office today to schedule an appointment with one of our dentists here at Dothan Dental Group. We’ll discuss your options and help you choose the solution that is right for you.